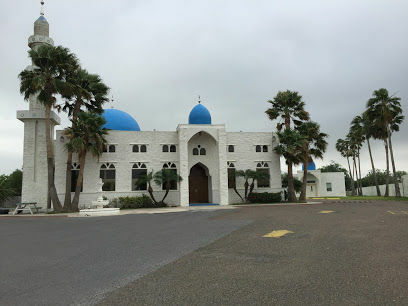 EDINBURG — A newly erected building inside the grounds of the Arridwan Mosque in Edinburg served as the site for visitors to get acquainted with Islamic practices Saturday. Designated rooms offered activities, from henna tattooing to face painting, on either side of the hallway. Upon entry to the artifact room, Susan Hammami greeted guests with a few drops of orange blossom water. Many of the artifacts on display, such as mosaic jewelry boxes and decorative trays adorned with geometric shapes and leaves, were brought from her home. These traditional pieces, she said, forgo printing faces of animals or religious figures, as they are not to be used for worship. Since the event began three years ago, Hammami has participated and has been involved in the Muslim community of the Rio Grande Valley for 20 years — since moving from Syria. “Every year we are trying to use our experience to make it bigger and more welcoming … and show more of who we are,” she said. Within the South Texas region, said Masjid Arridwan board member Tareq Allan, there are five Islamic mosques, which work in conjunction. The Islamic community made the event possible. All food, souvenirs, train rides and demonstrations were offered free of charge. Attendees were given vouchers to try Arabic food from Abu Omar Halal, a food truck based in Houston. The owner made the trip down specifically for the day and made preparations to serve 1,000 meals. Members of the Muslim Student Association from the University of Texas Rio Grande Valley were present to assist with the operations. Under a tent they stayed shielded from the rain and signed-in hundreds of visitors from 11 a.m. to 4 p.m.
Tours of the prayer room were given and details of the service were explained. On Fridays, the “biggest day of the week” for worship, said Allan, Muslims unite for the “juma” prayer around noon. Prayer is consistent throughout the week and is done five times a day. Imams — Muslim leaders — answered questions from the community and Christian visitors, primarily concerning what Muslims believe about Jesus, said Allan. A group of Robert Vela High School students, encouraged to attend by their history teacher, waited in line to try henna. One of the common misconceptions about Islam, said Hammami, is that women are discouraged from receiving an education. Hammami holds a master’s degree in accounting, which she obtained while living in Syria, and holds a management position; her mother was a teacher. While she chooses to dress in the traditional attire, including a hijab, it is optional and not forced upon women. She said her 16-year-old daughter chooses not to wear one.